If you’re wondering why I use bread mixes so much, it’s because, after years of baking gluten-free, I’ve wasted an unbelievable amount of flour. When you try to bake gluten-free, if you are using three or four different flours and a binder for each different sort of baking item, it gets really confusing, and hard to estimate how much you will need of each item. It’s much easier to use bread mixes for bread-type recipes, muffin and scone mixes for muffins and scones, and pastry mix for pie crusts and pastry. If you buy a box of gluten-free cake mix, a box of all purpose gluten-free flour, and three or four boxes of bread/pastry/and muffin mix each month, you’ll spend about $24.00; if you are baking for only one or two people, nothing will get wasted. The only other thing you need is plain white rice flour (not sweet, just plain, from Kinnnickinick), for kneading and dusting regular gluten-free mixes. Having said that, this is a pretty standard wheat bun recipe, remade gluten-free from a box of King Arthur Flour Company Bread Mix from my local grocery in Texas. large mixing bowl, large enough for kneading dough in. Crack the eggs into the bowl. Add the milk and water. 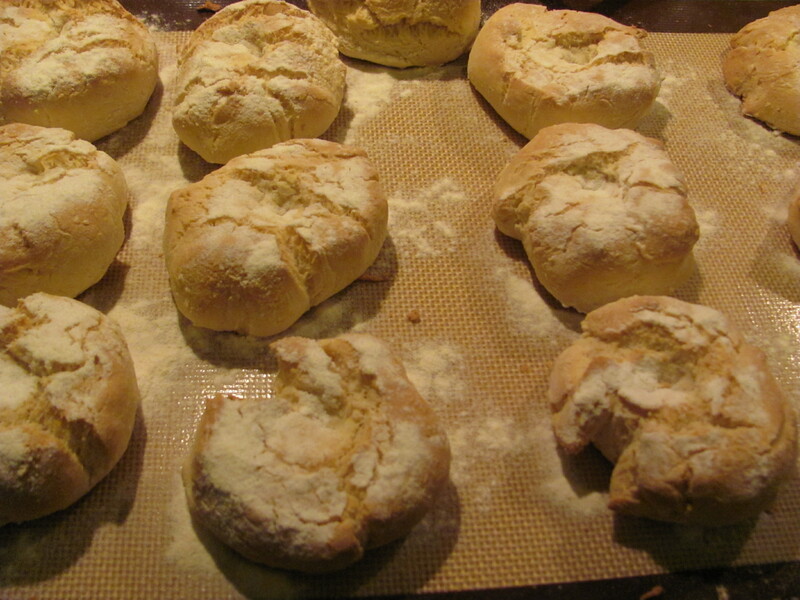 Add the packet of yeast from the bread mix box and mix well with the beaters. One cup at a time, add the bread mix. The bread mix will start to slow down the beaters. Once most of the mix is in the bowl and mixed up, scrape the dough off the beaters and switch to mixing with a spoon. (You can, if you have it, use an $200 electric mixer, but it’s an extra bowl to clean and you don’t get the arm workout that mixing by hand provides.) Mix the rest of the batter up and cover the mixing bowl with plastic wrap. Leave the whole thing to rise for one hour. After an hour, punch down the risen dough, and pour plain rice flour on to your, clean, dry hands. So you won’t have to flour a work surface–believe me, you’ve already got flour everywhere by now–you’re going to knead the dough in the mixing bowl. (I never thought I’d be the sort of person to be kneading dough, but, then I never thought I’d be unmarried and spending my Saturday nights doing a gluten-free food tour of the U.K. in my kitchen, at forty, either.) Knead the the dough for about four minutes, adding rice flour as you go to make it less sticky. (This is very sticky. You may initially need to stop to scrape the dough from your fingers.) Take out the cookie sheet, and put the silpat on it. Form the dough into a log, and cut circular slices from it, taking care not to scrape the silpat. (Oopsie.) Form the circular slices into buns, and place them at least an inch apart on the silpat. Dust the buns with regular rice flour and cover the cookie sheet with a tea towel. Set your kitchen timer for another thirty minutes and let the buns rise. Turn the oven to 400 degrees. When the buns have risen for another thirty minutes, make an indentation in the center of each one with your thumb. Put the buns in the oven, and set your kitchen timer for twenty-five to thirty minutes. Clean up all the flour that is all over your kitchen. (It’s there. Just start cleaning.) Take the buns out of the oven when they are slightly golden. Serve with butter, or marmalade, if you’re the sort of person who actually has marmalade. Makes about 10 buns, at about .50 cents or .25p apiece.